St. Martin's Griffin, 9780230614413, 256pp. In October 2001, nineteen-year-old Murat Kurnaz traveled to Pakistan to visit a madrassa. During a security check a few weeks after his arrival, he was arrested without explanation and for a bounty of $3,000, the Pakistani police sold him to U.S. forces. He was first taken to Kandahar, Afghanistan, where he was severely mistreated, and then two months later he was flown to Guantanamo as Prisoner #61. For more than 1,600 days, he was tortured and lived through hell. He was kept in a cage and endured daily interrogations, solitary confinement, and sleep deprivation. 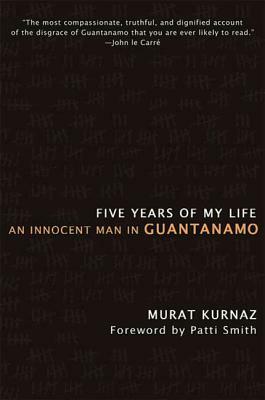 Finally, in August 2006, Kurnaz was released, with acknowledgment of his innocence. Told with lucidity, accuracy, and wisdom, Kurnaz's story is both sobering and poignant--an important testimony about our turbulent times when innocent people get caught in the crossfire of the war on terrorism. Murat Kurnaz is a Turkish citizen and legal resident of Germany, where he was born in 1982. He was in the process of becoming a German citizen when he was arrested in Pakistan and held prisoner for five years. He now lives in Germany. Five Years of My Life is his first book. “Murat makes the horrors and inanities of Guantánamo so real; his voice is by turns young and headstrong, wry and wise. Murat's mother came to the Unites States to hear our first Guantánamo case argued before the Supreme Court back in 2004 - when I met her, I didn't know whether she would ever see her son again. Now he is home safe and has produced this riveting and moving account of his torture and abuse at the hands of the U.S. government to shine a light in a dark place and try to help all those still languishing without hope. This is a must read.” —Michael Ratner, President of the Center for Constitutional Rights and attorney representing the Guantánamo detainees.